Elements Europe has successfully manufactured, delivered and installed 914 bathroom pods to phase 1 of BCEGI’s Middlewood Locks residential development in Salford. BCEGI approached Elements Europe to deliver the bathroom pods for its client Scarborough Group. “We have found the level of service that they have provided to be exemplary. Despite the challenging programme, Elements Europe have hit all delivery targets without sacrificing quality.” Commented Aaron Adams, Head of Construction BCEGI UK. “During our visits to their headquarters Elements Europe has demonstrated their internal procedures that gave us the comfort we needed to be confident that they were able to deliver large numbers in the required timescales to exacting standards” added Aaron. Elements Europe worked closely with BCEGI and architects WCEC to design and manufacture 9 different bathroom pod types including main bathrooms, en-suites and jack and jill arrangements for the 6 blocks of apartments which make up phase 1 of the development. 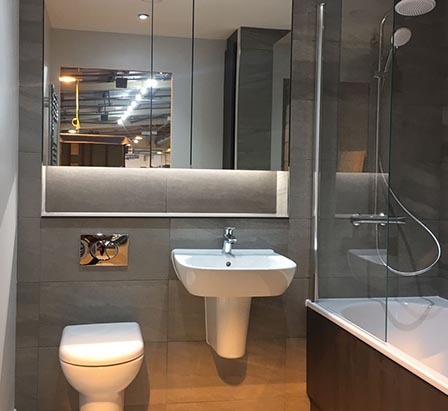 Each type was designed with high specification sanitary ware, brassware, large lighted mirrors and high quality material finish adding to the attraction of these residential apartments once they go to market.